The Black Widow Spider belongs to the class of animals called Arachnids, which differ from arthropods in that they have 8 legs and no wings or antennas. Most spiders located in the southwest are venomous, however few are dangerous to humans. 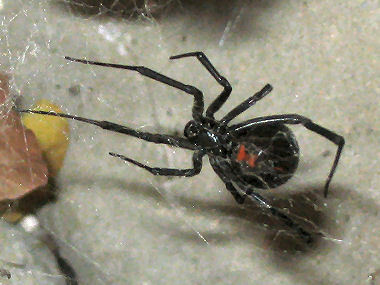 The female Black Widow is one exception (males are non-venomous), the Brown Recluse Spider is the other. Though rarely fatal or painful, the bite can cause serious reactions in humans including dizziness, nausea and abdominal cramps. If bitten, the best course of action is to call your local poison control center to determine if medical treatment is warranted. 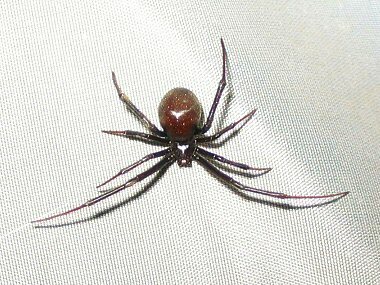 The Black Widow has a shiny black or dark brown body that ranges from 0.5 - 0.75 inches in length and has a bright red hour glass shaped marking on the underbelly. Males are usually half the size of females. The Black Widow Spider at right was found in my backyard under a cloth barbeque grill cover guarding her egg sack. Black Widows eat insects which they trap in their irregularly shaped webs. They are typically nocturnal and are shy and non-aggressive, though will bite if provoked. Females mate only once in their 1-2 year lifetime and will occasionally eat the male afterwards (thus the name 'widow'). The female will then lay up to 300 eggs which she encases in a whitish colored spherical egg sac.